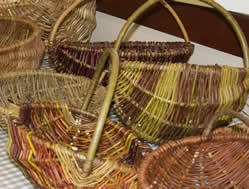 The second of the basket weaving days was held on Wednesday 28th November in the Recreation Room. 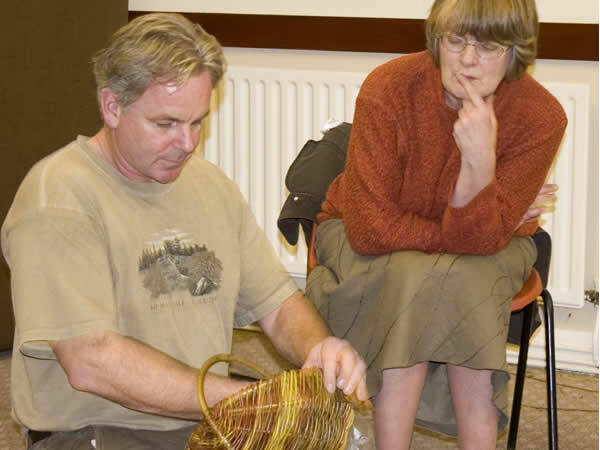 Ray Lister and his partner, Samantha, once again shared their expert knowledge of basket making with members of the History Group. 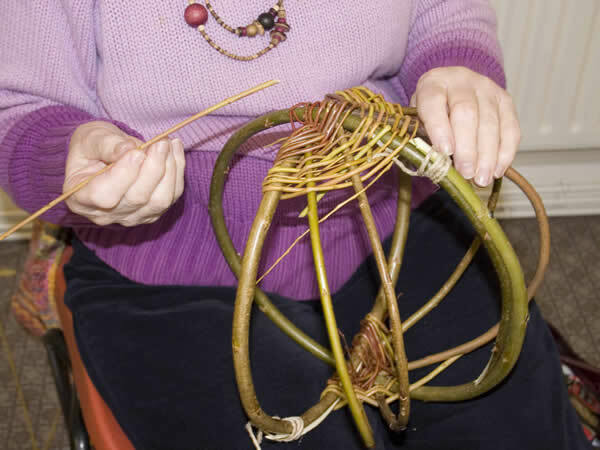 On this occasion the task was to produce a ‘framed’ basket using the various materials supplied on the day. Ray also brought along several examples of framed baskets and gave a brief history and description of each prior to the practical session commencing. In his usual relaxed style Ray began by showing everyone present how the basic ‘frame’ is constructed using a ‘hoop’ of willow which is worked into a curve and then bound to the shape of a circle. 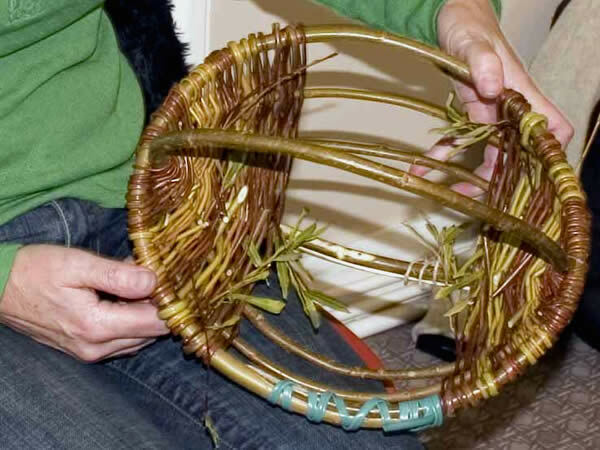 Two hoops are required to make the basic shape of the basket – one hoop that forms the handle and depth of the basket and the other forming the rim. The two hoops are held together (one inside the other at right angles) and bound by a strip of willow forming the shape of a ‘cross’. A few weaves later 4 further reinforcing frames are secured into place into the ‘pockets’ that have been produced and the weaving then continues in and out of the frames and hoops until the frames are completely filled in. Ray and Samantha were on hand throughout to supervise and assist. 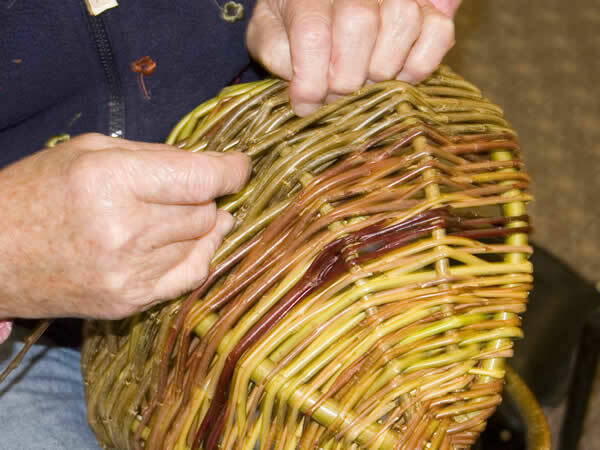 Once the group had learnt the basic weave and had secured their frames they were able to work at their own pace and using their own choice of the various varieties and colours of willow provided to create their individual ‘masterpieces’. The day was informal and relaxed, starting at 10am and finishing about 4pm with a short break for lunch. By 4pm everyone had completed their basket and the only task left was to find something useful to put in them! Click here for History Group History. Click here for History Group Diary of Events.